The century-old building has a brick facade where wood siding once was. Martin Luther King Jr. spoke there, Jimi Hendrix and Billie Holiday played and sang there, and the city's first documented jazz performance was reportedly held there in 1918. A lot of history was made inside Washington Hall in the Squire Park neighborhood, but the 102-year-old building almost became history itself: It had fallen into disrepair over the past few decades and was in danger of being demolished. 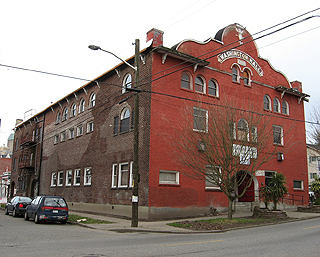 The nonprofit Historic Seattle stepped in last year and bought the 25,900-square-foot building for $1.5 million from the Sons of Haiti. Historic Seattle has since received a $380,000 grant from the Washington State Historic Society and is putting up $435,000 of its own funds to get the building habitable. It also received a $16,000 Landmark Challenge Grant and a $40,000 Heritage Facilities Grant from 4Culture, which also contributed $250,000 to help buy the building. Key Bank provided a $1 million loan toward the purchase. Eugenia Woo, director of preservation services at Historic Seattle, said they started cleaning up the building last fall and have done some initial repairs, including work on the original boiler and radiator heat system. The kitchen was also updated and parts of the roof repaired. Some upgrades were made to the electrical system, but more are needed. Woo said the building ultimately will need a full renovation, including a seismic retrofit, and they would like to add an elevator to make all three floors ADA accessible. Those upgrades, initially estimated to cost $2.5 million are now closer to $6.5 million, she said. Estimates went up after crews did some soft wall demolition and found water damage and dry rot. Workers also found the entire roof needs to be replaced. Woo said they recently discovered the building originally had wood siding. Brick cladding was installed during a 1918 alteration. She said the goal is to retain as much as possible, including the bricks. Historic Seattle's team includes SMR Architects, general contractor Rafn Co. and structural engineer Coughlin Porter Lundeen. Woo said the renovated space will be a performing arts center and community gathering space, which are what the building has been used for since its inception. There are two main spaces for those activities: the first floor Lodge Room and the second floor auditorium/performance hall. Woo said the Lodge Room will be rented for meetings, receptions and lectures. The auditorium will be for music, dance and theater, as well as providing a space for events that are too large for the Lodge Room. Both have open floor plans, with no fixed seating. The auditorium's capacity is about 350. There are single-room housing units in the west section of the building that Historic Seattle wants to rent out as office space. The group also plans to have a caretaker's unit on the first floor. Historic Seattle is beginning a fundraising campaign and is seeking additional grants for the remaining work. Woo said they hope to find an arts partner that would be a permanent user of the building. In the meantime, the group plans to open part of the building for performances and meetings. It also is holding a series of workshops covering old house preservation techniques. Craft workers will restore a section of the building to educate homeowners. The next workshop, covering woodwork refinishing and repainting, will be on Saturday. A grand reopening party is scheduled for the weekend of May 1-2. Historic Seattle last weekend launched a Facebook page for the building and hopes to launch a Web page by mid-month called http://www.washingtonhall.org.